As the influence of multinational corporations over public policy continues unabated, the key challenge for those campaigning for social and environmental justice is how to redistribute political power back into the hands of ordinary people. It was a “Suitable Introduction” I‘ve borrowed it from this oldarticle that I recommend to take a look on it & then let us agree. 1- The corporations are entities that doesn’t know except a “profit” language, so they seek always to profit, seek to creating its resources & getting its tools. - Where they who are put the terms of the agreements which they hold them & who are oblige the governments to achieve them. - They who are involved in the enactment of laws which the governments put it for their countries. - They who are determine the relationships between the countries too. 3- So, We can say that the corporations have a power to put pressure on the governments. Of course there are economic reasons; this is often the reason for most of the occupations, then for looting and plundering the wealth of the countries & then suppressing the people to surrender and subjecting them to this occupation, and deprive them of all means of resistance that they can use. We know that Turkestan has a Muslims people & China as we see is using “the religious persecution” as a mean to creating a justification to can continuing the practice its crimes against Turkistan people “Uighurs” from “ killing, massacres, arrest, torture & trying to demolition the religious identity .. etc.” under the pretext of fighting the terrorism who are represent a threat to state security or fearing from the intolerance or so on ..
China want to grab the land & else want the people wouldn’t care about their land more then they try to save their life & their religious identity. If we notice that Chine is a searcher for resources of wealth, lands, and productions, whatever any resource help it to growth its economic & creating new markets, then the government call& use the MNCs to begin to extracting, producing and marketing those resources “Investments” through the signing of agreements as we know . And because the governments has become doesn’t care about the life of the people , but they has become fight & kill the people for stealing more of their properties for make more investments ..
We have decided to deal directly with those corporations without putting China's government as an intermediary between us. We deserve more than them... isn’t that? We are their real customers, who are buying their goods & products and we are the cause of their profit. We are only looking forward for our right to life with all meaning of life as it should be, Of Worship - marriage - procreation - travel and moving - Study – Stability & Before all this we ask the security & safety. “ISA” We should do agreements with those corporations, we would to create a new & appreciation profiting markets for them, supply the ideas of products of our needs, would be a source of profits to them, and guarantee them to be their basically customers for whoever of them once agree to deal with us. The idea is a very simple, & how to apply it is a very easy , just it need to effort an activity, positivity, working, industry, volition, & patience for reaching to positive results like any idea which has a target. 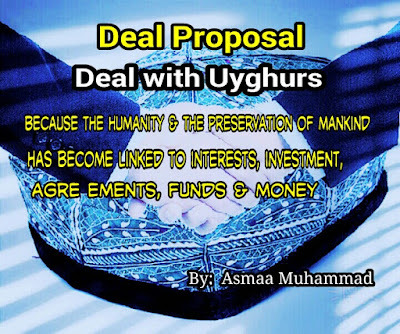 Once the corporation agrees to deal with Uyghurs, that mean it would begin to recognize with Uyghurs’s issue, accordingly their right of life & on their land, it would be huge gain for Uyghurs & their project. That would be in line with the human rights endeavors of course. From this point, Uyghurs people could to get a power & converting point for them on their land. The idea would start to work gradually, to organize a list of Uighurs definition “Who are they”, listing their suffering, asking for cooperation with them, presenting an agreement, treaty, conditions, and the narrative of the gains that would be accrue to the other party and the privileges that they “CO.” will get them in case of approval of the deal. All that would be OPENLY through massive propaganda through social media, direct correspondence to those companies & their ECO and the direct orientation to the headquarters and expositions of these companies to make interviews with them. They have to know that they are competitors to each other, & if they ignore or disagree to deal, there are another will agree it, so they lost a big deal if they disagree that. It would be like a marketing for a new product of us.. & it is actually. We have to know that is our issue & we should make for it a huge propaganda & marketing, we have to try a best. Ending, we have to know about this idea would be like any idea, any fighting, any working, & any product.. it would be able development, modifying and changing depending on what waves will follow, the responses it will receives, the size of our working too& other conditions and factors. Secondly point we have to bear in mind that we are not working for only Uyghurs, but a many people of the population of Asia. It explain a useful point that we talking about of Corporate Social Responsibility. & if they want to get a profit from our market power.